So I went to the Danish Book Fair/Convention in Copenhagen this weekend. (Bogforum - Danish website). It was really big and exciting, but (unfortunately) it was more or less exclusively Danish authors and Danish books and I don't actually read much of either. Books in Denmark are very expensive, as the market is just not that big, so even though they had a lot of sales at the fair, it was still too pricey for me. I did get a few books though and even one comic book! 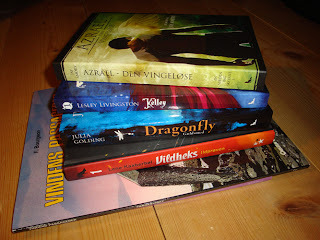 They are all Danish translations, except the last one which is actually a Danish book/author (and signed by her too!). I usually prefer reading books in their original language (=English) but can't have it all I guess. The comic book I got is the second book in the Passengers of the Wind (Les Passagers du vent) series by François Bourgeon, which was the only one in the collection I didn't have. Wondrous Strange - I've recommended Tellerup translate this. Haven't heard of the last one, sad to say, but I've read some of Lene Kaaberbøls other books and really liked them.